One of the small injustices of the world, is that Soldak Entertainment's Din's Curse was unable to get listed on Steam - without any explanation from Valve as to why. Until now. (The game is on Steam; not that Valve has suddenly given them an explanation). I've mentioned one of their earlier games, Depths of Peril as a Diablo like with an interesting twist, and Din's Curse is very much another spin on the genre. Unfortunately, it appears that Tom Chick's excellent review of the game is no longer around, so I'll point you in the direction of this thread at Quarter to Three instead. "He is like the Tony Stark of roguelikes." Everyone except Jeff Lait can click on this link. (I seem to recall Darren Grey attempting this as well). I'm seeing more and more newly released roguelikes not being featured in the usual places that I collect games released for the year for the Ascii Dreams poll. While I appreciate the growth of the genre, it also puts me in a similar position to where I was in last year, where I may have to consider going outside the parameters I've set for letting people qualify in order to include notable new releases. I'd like to have a more considered discussion around where I should be collecting entries from: should it be a case of trying to keep the existing Rogue Basin releases and the Active Developing Roguelikes list up to date? Or should I be including other sources (like Free Indie Games) which feature roguelikes periodically, or even go further afield to sites which have a commercial focus with the intent of being more inclusive but at the same time perhaps more controversial in terms of what is in the list? I've deliberately highlighted Free Indie Games, because for me it is important that the poll celebrates non commercial and hobbyist games as much as indies and commercial releases. There's also a practical balance here: it is already a big effort consolidating the two sources I usually use, without having to comb through non-roguelike related material to find entries. I should also be clear that I'm not criticizing Michał Bieliński (of Actively Developing Roguelikes) or any of the regular contributors to Rogue Basin for failing to include these games: with the rise of roguelikes and indie games in general there's just more places where these games are coming from and being promoted in. Must check out Fog and Thunder, a moody Russian roguelike. 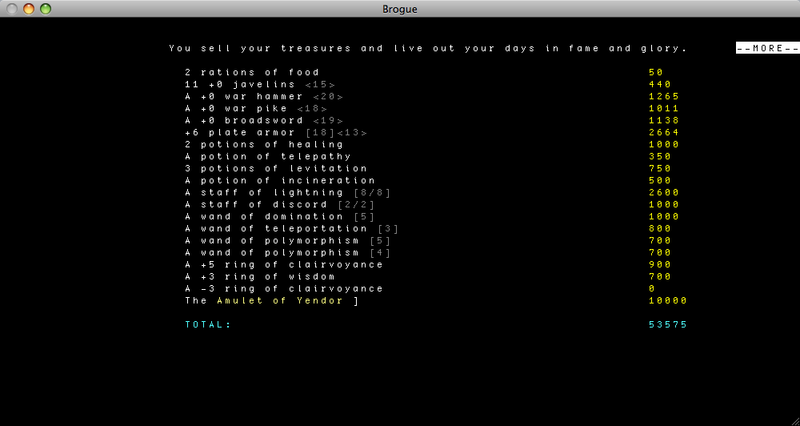 I've been playing roguelikes since c. 1990. I've just beaten one for the first time. Brogue spoilers below the pic. 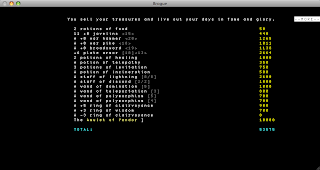 Brogue: Enchanted plate armour up to its final value, then staff of lightning from [2/2]. Had an ogre trained up with Protection for a while, then lost him, rescued a Tentacled Horror and finally got him to eat a Dar Priestess for Healing, after bouncing him off everything else. Polymorphed every dragon I saw, had more than enough healing/telepathy/magic mapping for the final few levels. The only times I really felt threatened was an out of depth flame turret across the level which I jumped into a chasm to avoid, and when I ran into my first Dar battle pack torturing said Tentacled horror. Of course, when I read an unidentified scroll to try for options, and said scroll was summon monster and it didn't materially impact the situation I was in, I knew I was pretty good for a victory. Verdict: Plate armour in brogue is probably OP. The seed I had was definitely OP - three stacks of javelins in the first few levels (two in the same room), and it just persisted in throwing plate armour at me.